Hello! Hope everyone had a great weekend. I was able to get a lot of work done and still find time for a bit of relaxation - a collegiate miracle! Anyway, I wanted to tell you about what I did this past Wednesday with my fellow blogger and friend Alex. As you may know, we are both a part of Edmundite Campus Ministry, which we call VITA (it means "way of life" in Latin). One of the many wonderful programs that VITA offers is called Dessert & the Divine (D&D for short), and Alex and I were lucky enough to be asked to lead this program this year. D&D runs on the last Wednesday of every month, so this past Wednesday was the first one of the year. I'll admit Alex and I were slightly nervous to be running the whole show by ourselves, but with a bit of planning and praying, I think we did very well! The concept of D&D is basically to have a discussion that relates to God/our faith in some way, while also incorporating some delicious dessert. This week, Alex and I chose to make sugar cookies. We also provided icing and sprinkles so that everyone could decorate their cookies. We decided to focus our topic of discussion on how our relationship with God has strengthened since being back at school this year. 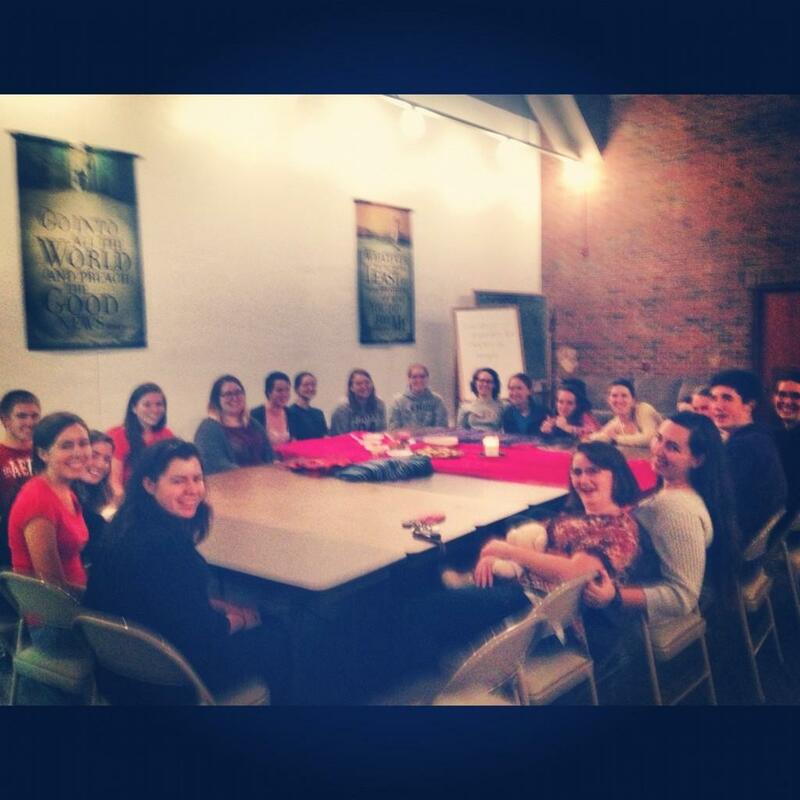 Everyone who attended was able to contribute to the conversation as well as enjoy a cookie or two, which was wonderful! Alex and I were and are very pleased with how everything went and we can't wait to do it again next month! As I mentioned, I was a bit nervous about leading Dessert & the Divine this year. I have had leadership roles in the past, but I have never been a huge fan of talking in front of people. However, especially in this context, I relied on both God and the wonderful people around me who are part of VITA to help me get rid of my nervousness and have a successful night. Alex and I decided to have a quote of the month at every D&D meeting, and this month's was: "Give your troubles to God, He's up all night anyway!" (Unknown). I love this quote because it's fun and gets across the idea that God is always there for us. Speaking of quotes, my roommate Emma (check out my post about her here) got us some magnets to go on our refrigerator, and one of them has a quote that says: "Life begins at the end of your comfort zone" (Neale Donald Walsch). When I first read this, I wasn't sure I knew what it meant. After Wednesday's D&D was over, the meaning really hit me. I was really proud of Alex and myself for taking on a new challenge which turned out to be extremely rewarding. Another situation that made me slightly nervous this week happened on Thursday. I had a meeting right around the time I normally get dinner, so I knew I'd have to eat when I got out. This may sound silly, but I get nervous about sitting by myself in Alliot (I'm sure at least a few of you can empathize! ), but I had to eat, so I prepared myself for this possibility. Once I got to Alliot, I immediately saw some people who I was comfortable sitting with and had a great time eating with them. It was definitely something little, but I was really proud of myself for being able to go talk to people I don't necessarily see every day. One of the great things about Saint Mike's is that just about everyone you meet is so friendly and welcoming - I really had nothing to be afraid of! Hope everyone's Sunday is going well and for those of you at SMC, thank you for your smiling and friendly faces! And as usual, thanks for reading my blog! Love love love the blog Merrill! So glad D&D is going well - just look at that crowd!